Daniel and Cristina broke into the international tango scene when they first won the Tango Mundial in 2008. 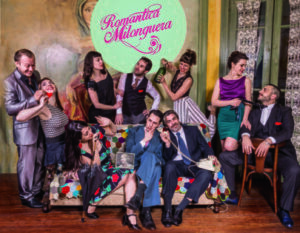 They were the metropolitano city champions in categories Tango and Milonga and then went on to win the World Tango Championship in the tango salon category. They are absolute masters of the tango “salon” style and an emblem of elegance, dancing with a warm presence and also adapt to stage tango and choreography. Fernando Gracia was the 2007 World Stage Champion. Sol Cerquides was the 2010 Campeona Metropolitana city champion in the milonga and also 4th place in the World for tango Salon category. Today they are one of the most famous stage tango couples in the world if not THE premiere stage tango couple. Their precision and effortlessness is breathtaking. The hottest orchestra in Buenos Aires right now and visiting Copenhagen for the first time and they will play live on the opening night Thursday 10th of May. They are cool, dynamic, romantic and playing wonderful arrangements of classic Tangos. There is no doubt that they will create a party on stage and on the dance floor.